“They treated me like royalty,” says Vero Beach artist Barbara Krupp, who was honored this summer at the dedication of a brand new, six-story Graduate and Health Studies building at the University of Tampa. At 91,000 square feet, it is the biggest building on campus and is now also the permanent home of the largest collection of Krupp paintings in the world. 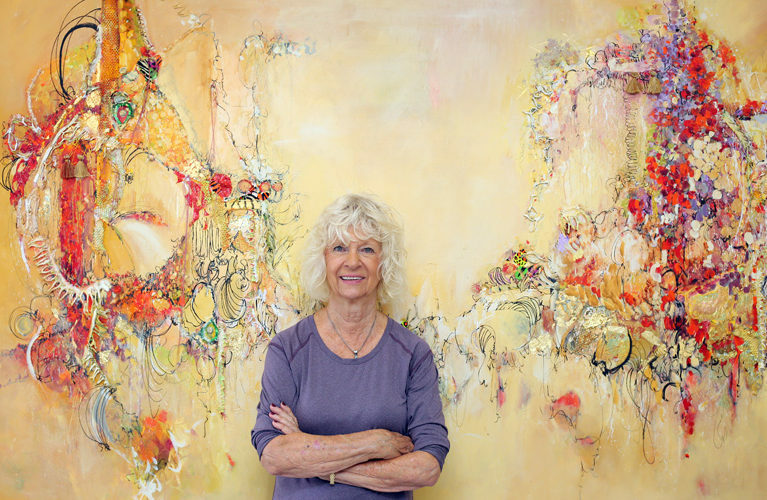 Artist Barbara Krupp pictured in her studio. Painting – Mr Toad Is At It Again. The university began to purchase Krupp’s abstract paintings specifically for the building early this spring, while the structure was still under construction. They eventually acquired 53 works for their collection, comprised of acrylic on canvas paintings from the most recent five years of the artist’s career. In addition to UT’s Office of Graduate and Continuing Studies, the building houses classrooms for its nursing and physician assistant medicine programs, health science labs, a physics research lab, student gathering and study spaces, and faculty offices. When the building was dedicated on Aug. 31, a major part of the ceremonies revolved around Krupp and her art. And when the university’s president, Dr. Ronald L. Vaughn stood to speak, “he talked about me,” she says. Not bad for a painter who never went to art school (or any college for that matter) and whose art career began as a mother of four young children in Wakeman, Ohio, who wanted to “play around” with watercolor. 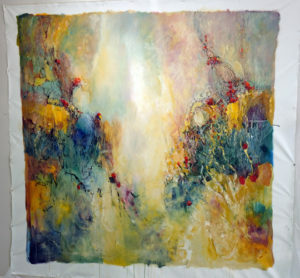 After a few lessons and some success selling her paintings for $15 apiece at a local flea market, Krupp decided to buy a tent and hit the art show circuit – which she retired from five years ago after a very successful 38 years. Her earnings made life markedly more comfortable for her family and put her kids through college. “I have always made a good living doing art,” she says. “Everything is just perfect,” sighs Krupp, happily. The first works an art tourist will see hang in the spacious student gathering area – part lounge, part study hall – on the first floor. The room’s warm gray walls, black armchairs and red occasional tables are a low-key backdrop for two luminously colorful paintings that hang on adjacent walls. While all of Krupp’s other works in the building were purchased by UT from her existing oeuvre, those two – each one 5 feet high and 15 feet wide – were commissioned by the university, which, according to Krupp, was an easy taskmaster when it came to the paintings’ themes. “I could do anything I wanted,” she says. Although they are as abstract as any other work in Krupp’s oeuvre, the paintings contain messages for and about the school and its students. With Krupp acting as interpreter, the one titled “Breath of Immortality” can be “read” from the right-hand side of its long composition to the left. Executed in a palette of violet, blue, red, orange and ochre with black and white accents, the visual tale begins with two peanut-shaped forms that represent swaddled twin babies. Small squares of black, red, scarlet and gold – the school colors – appear in a vertical row between them. Those babies “will be going to the University of Tampa,” Krupp explains. The forms that follow are abstract representations of internal organs – a uterus and a kidney among them, from which ruddy blossoms spill. The cascade’s spray drifts toward a heart, whose pulsations are implied by the flame-like shapes that surround it. Beyond that traditional seat of life and love appears a detail from the heart of the campus, one of the onion-domed minarets of Plant Hall. Built in 1898 as a hotel, the unique structure is more than a fine example of Moorish Revival architecture. It is the symbol of University of Tampa itself. Since assuming the presidency in 1995, Vaughn has seen UT’s enrollments nearly triple, its academic programs expand to more than 200 areas of study, and annual revenue increase exponentially. Vaughn has also overseen $600 million in new construction on campus. It’s no surprise, then, that Vaughn’s fingerprints are all over the selection of art for the Graduate and Health Studies Building. Pat and Dave Dabbert are the owners of Dabbert Gallery in Sarasota, which offers paintings and sculpture by a variety of contemporary artists. Krupp has been represented there for the past 14 years. Nearly a year ago, a social event at the gallery occasioned the Vaughns’ first glimpse of her work. It was not to be their last. The Vaughns soon returned to examine the Dabberts’ stock more closely, hoping to select works by several artists to enhance UT’s newest building. The Vaughns purchased 17 of the 30 Krupp paintings the gallery had on hand, and informed the Dabberts they had decided to go with Krupp’s work for the entire building. The purchases continued over the next few months. According to Krupp, Ronald Vaughn “would have bought 100 more” of her paintings, but Mrs. Vaughn held the number to a manageable 53. What is about Krupp’s work that so caught the imagination of a university president that he wanted to fill a building with it? Krupp believes that the appeal of her paintings is due in large part to their being abstractions; not only of things, but also of thoughts and emotions. “They make you feel, they make you think. You get to decide what they are about,” she says.